There's a war on—and Lin Jensen isn't gonna take it standing up. In 36 riveting scenes, Pavement shows how the Buddhist perspective can help us all, even in the toughest times. Every day, Lin Jensen has gone down to the center of his small town of Chico, California, plopped down a meditation cushion, and sat "peace vigils" in protest of the US invasion of Iraq—his honest effort to change the world. From his knee-level spot on the pavement, he has encountered a wonderful array of what Lin calls "uprights": a heart-breakingly generous homeless man who offers Lin his only possession; hostile passers-by who shout "F@#k you, Peace Wimp! "; "White Wolf," who punctuates every comment (always shouted!) with a sharp poke to Lin's chest; compassionate soldiers; and more—all amid rain and bright sun, exhaust fumes, and the scent of azaleas. Jensen, the author who so moved readers with his acclaimed memoir Bad Dog!, here shares what sidewalk-dwelling has taught him about humility, generosity, and what it really means to love our neighbors. It's inspiring, good-humored reading—especially for anyone who might work or wish for change but doesn't want to be just spitting into the wind. "This is a truly inspirational book. It is a powerful testament to the connection between spiritual practice and the yearning for peace." "Lin Jensen reverses the adage, 'Don't just sit there; do something!' into, 'Don't just do something; sit there!' He says he does nothing for peace, but don't believe him. He's doing everything for peace, the simplest thing, the hardest thing--just being and living, full-time, for peace. The proof lies in this book--a word of peace, a way to hope, a vision of nonviolence. In a culture of war, that's something, and much more. Thank you, Lin Jensen." "This book has been an almost-daily source of inspiration in the mornings before rising. Its 36 short chapters are an easy read, but squarely address a tough theme--how to respond as a Buddhist when you are a citizen of a country you believe to be violent and to be engaged in violent acts, in this case America and her war in Iraq. [ . . . ] The book is not primarily a political book, nor was it written specifically in response to America's war in Iraq. It simply springs from them as a primary meeting-place between the real world and his ideals--with his practice of Buddhist meditation as a sort of crucible in which those poles can be reconciled. [ . . . ] I would like to say to Jensen, 'thank you--you have made a difference to me.'" "Jensen's gets to the pith of moments, to their deepest implications, weaving in Zen parables and past experience as necessary, all in the space of a few pages. He writes with clarity and a rare earnestness." 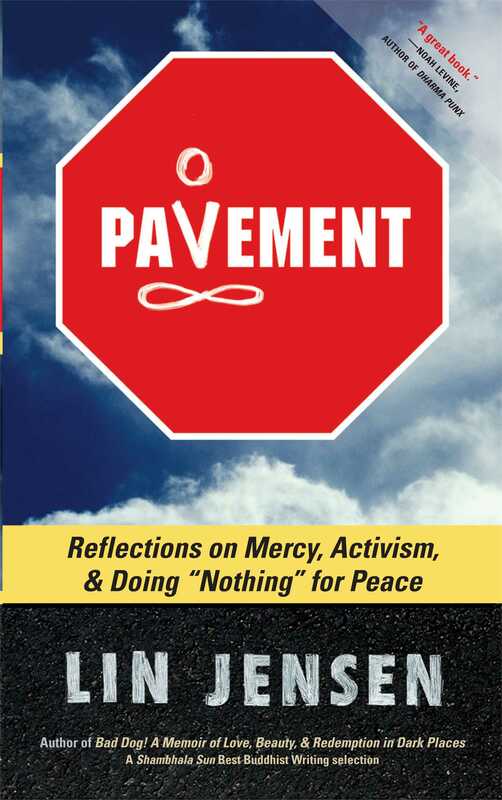 "Lin Jensen's book undermines the illusion of futility that surrounds nonviolent activism. It is a journal attesting to the meditator's perspective that true 'regime change begins at home,' right in the human heart and mind. Lin writes with insight and refreshing simplicity about his peace vigil. This book is the beginning of a good conversation about spiritual activism." "Riveting. Long after the war is over, this gentle, tough, funny, heartfelt book will still matter. It's a gift to all suffering beings, all of us, and should be accepted eagerly and gratefully." "Two years ago, as an expression of protest against the U.S. invasion of Iraq, Lin Jensen started meditating daily on a sidewalk in Chico, California, a little card propped beside him that identified his activity as a 'peace vigil.' In this short book, Jensen reflects on what he has learned, and especially what he has gained from the colorful characters who engaged with him. (With his gaze lowered, Jensen can only see their shoes. He refers to them as 'Uprights'). Jensen is a skilled memoirist who articulates well the internal doubts and fears that readers will reluctantly admit are familiar--at least once we see them on paper. For Jensen, the vigil is both necessary and futile, and with that tension, his observations are sharper. This is not a touchy-feely, do-gooder book, but it will make you seriously consider what you are doing for peace. 'After all,' asks Jensen, 'if I can't make my own peace, how can I ask it of others?'" "I enjoyed sitting down with Lin Jensen on the sidewalks of Chico, and observing his varied and surprising encounters with passersby--the upright people. With devotion, Jensen plunks himself down in public and does 'nothing' for peace, day after day--nothing but embodying it. His ruminations on the human condition, on warmaking and peacemaking, are like mini dharma talks, and his well-earned wisdom stretched my mind." "The author of one of my very favorite books, Bad Dog!, has done it again--this time with musings on how to talk peace without saying a word. He shows up, as few of us have the time or even the inclination to, by simply sitting on a town pavement with a peace sign--and he does this every day! Now he has captured the sights and sounds of his experiences in a piercingly honest memoir which reveals the human spirit. He's been poked in the ribs, shouted at, sat alongside with, stepped over, and applauded by the 'uprights,' who see him on the sidewalk. A rich revealing of a heart that won't be moved in anydirection--except toward love's possibilities. I love Lin Jensen's work and would take Bad Dog! and this on a desert island any day!" "A beautiful, profound book, well worth seeking out."